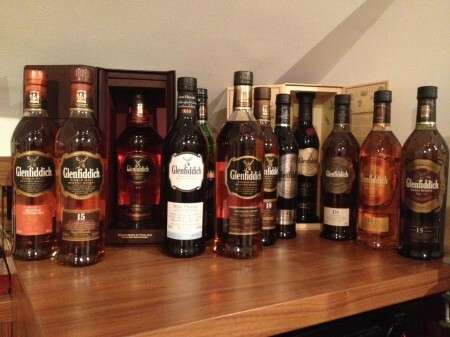 Read stories about Glenfiddich of A Wardrobe of Whisky blog. Look mum! Look! I have discovered how to buy Glenfiddich online! Now damn serious, if you plan to collect whisky, do your homework and find for the best prices at A Wardrobe of Whisky… you would have saved lots of money or you would be collecting LEGO… much like me. This chap is collecting Glenfiddich whiskies and the photo has 12 bottles of which 11 are clearly readable. I personally think it is a damn pity and a waste of time… don’t collect Glenfiddich… it is such a nice whisky that it is a pity that you don’t drink it. Glenfiddich Malt Liqueur: Honey honey! So I went into my wardrobe and grabbed a bottle of something from the past, something hard to find anymore and something good. Error 404: Bottle not found! Just kidding. I grabbed this bottled of Glenfiddich instead. This liqueur is a mix of Glenfiddich and tons of honey, and I mean tons and tons of honey. For sure they have discontinued it because there was no more honey in Scotland. How is it like?! I hear you cry. Here is the proper tasting note. 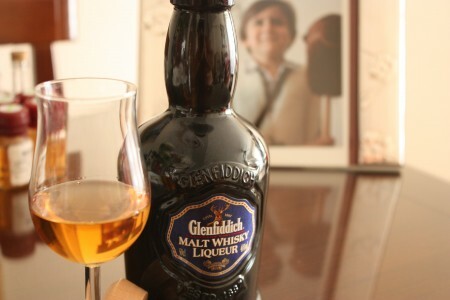 Glenfiddich Liqueur is outstanding, neither too rich nor too sweet. It maintains the traditional softness of a liqueur, but is enhanced by the warmth of oak casks and the subtle taste and aroma of Glenfiddich Single Malt Scotch Whisky. The spicy, honey flavour is perfect over ice in summer or drunk neat for a warming winter, after-dinner digestif. You better stock up bottles of this one as it is discontinued. You have been warned. Nose (81): average. honey, citrus, floral, spices. Palate (89): smooth, oily. sweet, honey, malt, citrus, spices, wood. Finish (87): average. honey, honey. So based on other whiskies I have already tasted I rate this Glenfiddich Malt Whisky Liqueur with 86 points over 100. It is a very nice liqueur. In fact it is the best that I have tasted. 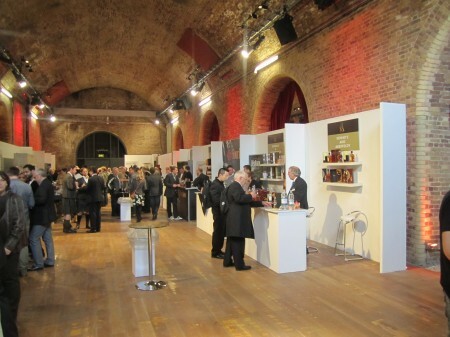 Really I don’t understand what could make Glenfiddich stop producing it. 70cl / 40% / Distillery Bottling - Originally a travel retail exclusive, Glenfiddich have now released Age of Discovery on the general market. Their first 19 year old whisky, finished in Madeira casks in honour of the Portugese explorers of the 15th century. Nose (90): more than average. honey, malt, fruity, sherry, nuts. Palate (91): powerful, oily. honey, citrus, fruity, smoke, malt, pastry. Finish (90): longer than average. honey, smoke. So based on other whiskies I have already tasted I rate this Glenfiddich 19 Year Old - Age of Discovery with 90 points over 100. 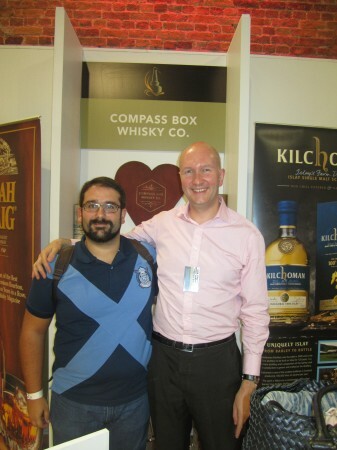 I have just complete the first floor of The Whisky Exchange Whisky Show, and after tasting very nice whiskies as Talisker 35, Midleton Rare or several Kavalan Solist. Now I run for the ground floor where more whisky is awaiting me. Hurry up! Hurry up Miguel! Ok, first floor has the whisky and food pairings, sure, very interesting. Thank you very much sir. Going one floor under it. Wooa! Mother of God! So much whiskies and so little time. Only two and a half hours for the show to close. ok! Ok! Don’t panic!. 21 year old Glenfiddich which has been finished in casks which previously held Caribbean Rum. They used to put Havana Reserva and then Cuban Rum, but the American's didn't like these Cuban links. Nose (89): strong. floral, apples, honey, cinnamon, citrus, a little brown sugar. Palate (89): smooth, oily, powerful. floral, candies, dried figs, spices, wood, dark chocolate. Finish (89): long. floral, dried fruits. So based on other whiskies I have already tasted I rate this Glenfiddich 21 year with 89 points over 100. Our master craftsmen have created a complex, mellow single malt Scotch whisky from years of patient maturation in casks of the finest Oloroso sherry and American bourbon. It is secreted away in our traditional warehouse, where the cool, thick stone walls and low ceilings mature the whisky to perfection. Years later what emerges is a Glenfiddich 18 Year Old with an elegant nose, faintly sweet, scented with apple and wood. It is robust and full-bodied, yet remarkably soft, rounded and long lasting. Nose (91): strong. floral, honey, citrus, liquorice, dates, dark chocolate. Palate (91): smooth, oily, powerful. peaches, floral, wood, spices, honey, vanilla, citrus, a little espresso. Finish (89): long. floral, wood, a little pears. So based on other whiskies I have already tasted I rate this Glenfiddich 18 year with 90 points over 100. The Glenfiddich 15 year old cask strength is creamy smooth whisky with floral and spicy, notes of black pepper and gentle luscious fruit. Bottled at 51%abv. Nose (90): strong. floral, honey, wood, spices, a little cocoa, apples. Palate (91): smooth, powerful, oily. peaches, floral, honey, wood, spices, cocoa, liquorice. Finish (90): long. floral, honey, cocoa, cinnamon. So based on other whiskies I have already tasted I rate this Glenfiddich 15 year Cask Strength with 90 points over 100. Using a Solera system common in the maturation of quality sherry, malt from three different types of casks is married together in a wooden vat, which is constantly topped up to ensure the quality is maintained. This is an awesome whisky from this Speyside distillery with lots of honey and flowers. A great value single malt. Nose (91): strong. peaches, apples, dates, honey, floral, a little nuts. Palate (91): smooth, oily, powerful. fruity, floral, wood, smoke, honey, liquorice. Finish (89): long. liquorice, floral, a little honey. So based on other whiskies I have already tasted I rate this Glenfiddich 15 year with 90 points over 100. Released in Spring 2010, this Glenfiddich Rich Oak has spent 14 years in ex-bourbon casks in the traditional way, before two separate finishes of 12 weeks in new European oak and six weeks in new American oak before bottling. We like the sound of this. Nose (90): strong. liquorice, vanilla, floral, peaches, wood. Palate (92): smooth, oily, powerful. peaches, candies, spices, wood, vanilla, a little smoke. Finish (89): long. floral, liquorice, honey, spices. So based on other whiskies I have already tasted I rate this Glenfiddich 14 year Rich Oak with 90 points over 100.